The Transactions menu within the Asset module of the SapphireOne ERP, CRM & business accounting software is a comprehensive tool that allows complete control of your company’s assets. Assets transactions store all changes that are made to an asset and the creation of monthly depreciation transactions. SapphireOne automatically creates depreciation transactions on all assets in your registry with the click of a button or depreciate individual assets manually. SapphireOne allows the user to calculate depreciation instantaneously for both tax and company reporting purposes. Update your General Ledger with an easy-to-use process for the part/full sale, purchase or revaluation of your company assets. Take full control of your asset registry by tracking assets that are being repaired, require servicing or are out on loan. The Transaction menu provides data entry functions which assist with asset control, data entry functions affect general ledger (GL), allows viewing of asset transactions, auto depreciation function, post transactions within assets, reversal of disposal and reversal of depreciation. This function allows the manual entry of depreciation into the primary method of depreciation (usually the official taxation allowed rate of depreciation) for tax purposes. This function allows the manual entry of depreciation into the secondary method of depreciation (usually the company’s specified rate of depreciation). Allows the recording of the disposal of an asset. Allows the recording the purchase of an asset. Allows the revaluation of an asset. Allows the recording of when any repairs are being done on an asset is being repaired for some reason. Records any servicing done to an asset. Allows the attachment of notes as a transaction entry. This inquiry lists all the transactions in a standard Inquiry screen. Locks the transaction selected from any modification. Transactions must be posted within Assets prior to sending them to the General Ledger. This function will automatically create depreciation transactions for the current period. This function will reverse the last Auto Depreciations function last operation. Conditions apply, check with SapphireOne support before running this procedure. Allows the complete reversal of the disposal of an asset. Depreciation Tax allows the manual entry of a depreciation value, instead of using the auto function. If a Project is entered and depreciation is run it will then be linked to the Depreciation Expense Account. Depreciation Company allows the manual entry of a depreciation value, instead of using the auto function. Enter in the particular method of depreciation to be used. This allows for the disposal of an asset. The system will then automatically create the disposal journal for posting to General Ledger. The %Sold data entry point allows for the partial disposal of an asset. The maximum allowable percentage is based upon the current WDV. It should also be noted that a value of, for example, 50.00879% will be rounded to the second decimal place 50.01%. Selecting the ‘do not transfer transaction to Financial’ checkbox tells SapphireOne that this transaction is to be retained in Assets and that a Journal for this transaction is NOT to be created in Financials. TIP: Once the disposal procedure is complete if you do not wish the asset to continue to appear in any inquiry lists, go to Asset Inquiry and mark the asset as Inactive. At a later date you may still view these inactive assets by going to the tools menu and selecting Include Inactive. This records the purchase of an asset and sets the historical values to be used. Before an asset may be purchased it must be created by going to an Asset Inquiry, selecting the button on the main toolbar to create a new asset. The ID that is entered for the new asset is the ID that is entered here for the purchase of that same asset. The system will also enter the next ‘int ref’ number and this may be altered by the user if required. The system will enter the current ‘period’ but this may also be altered. The tax code and rate are entered by the system and it is not recommended that they be altered. Sapphireone > Utilities \ Company Inquiry \ Control Accounts Page under the Assets Tab. The ‘vendor’ data-entry field is very important. If nothing is entered the system will create an MP when this transaction is saved. If a valid vendor ID is entered the system will create a PVI for that vendor. Next enter in the total for this purchase including any tax. 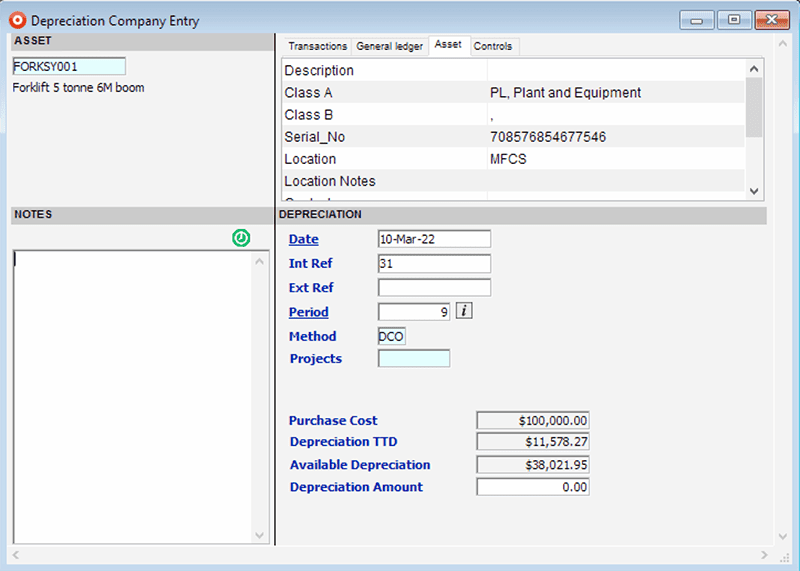 The system will calculate the tax that is in the purchase and display it in the Tax field just above the total as seen in this screenshot. Selecting the’do not transfer transaction to financial’ checkbox tells SapphireOne that this transaction is to be retained in Assets and that a Journal for this transaction is NOT to be created in Financials. The Revaluation facility enables an alteration in value of an asset, including the updating of the General Ledger. Selecting the ‘do not transfer to financial’ checkbox tells SapphireOne that this transaction is to be retained in Assets and that a Journal for this transaction is NOT to be created in Financials. The Change data entry field requires the movement in the Historical Cost, that is the Historical Cost of the asset was $35,000 and has now had an improvement of $5,000. This function enables the tracking of an asset when it is sent for repair and the expected date for the return of the asset, through Asset Management Reports. This assists in the tracking of assets which require servicing as part of their normal usage. TIPS: If the Next Service is given in “units to Next Service’ units, Assets will use the estimated usage to calculate a service date. When the asset is due back and when it is due to be next serviced can be tracked in the Asset Management Reports. This records when an asset has been released on loan for asset control. The asset can then be tracked through Asset Management Reports, on the basis of date due. Transaction Inquiry provides a list of all transactions in the system. Once transactions are posted they are automatically transferred to Financials. You may see this in the Transfer Column as transactions that have a posted status of Transferred. 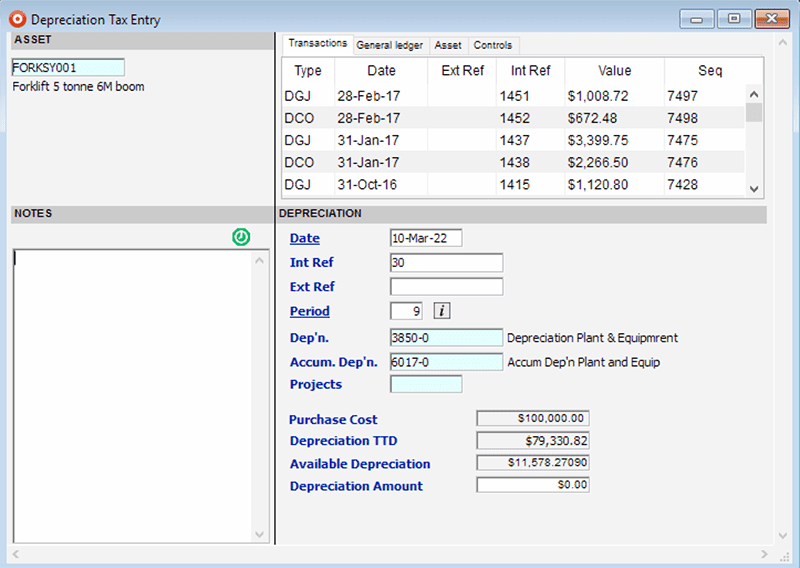 Normally most transactions from assets mode are now automatically transferred to financials and then posted by the system. This will then lock these records from any further modification. However, there are other transactions that may be conducted within Assets mode so the Posting function is provided here so that these transactions may be posted manually by the user when required. For example, a reversal of some type of transaction or the Sale or Purchase of an Asset. In the example above a vehicle was disposed of. This was not a normal transaction during the month so the resulting transaction will have to be manually posted. This screen will create the transactions required for the selected depreciation schedule, for the current period on all assets in the database. For the Primary Method (in Bondi Blue the Tax rate), transactions will be created here in Assets and then transferred to Financials where the appropriate journals will be created. For the Secondary Method (in Bondi Blue the Company rate), transactions will be created here in Assets and no further action will be taken on them. The system as seen above will select the Tax rate only to run this Asset Depreciation function on. The user must remember to also select the company depreciation option to tell the system to run that depreciation process as well. This function allows the reversing of the last Auto Depreciation function that was executed. This function would only be used if the Auto Depreciation function was executed by mistake. The system will only display asset depreciation transactions for any months that have not yet had the end-of-month procedure executed for Assets. When the Reverse Depreciation function is selected the system will display a small pop-up displaying a list of transaction that meet the criteria. This screen allows the recording of the reversing of the sale or disposal of an asset. Once selected, SapphireOne Assets will create all the correcting Journals required to reverse the sale/disposal for the Marked records only.